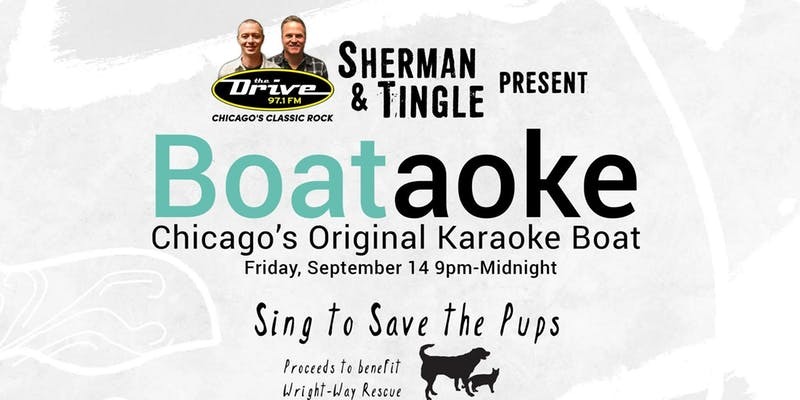 Sing to Save the Pups...with Sherman and Tingle! Boataoke 2018 is an effort to raise money for Wright-Way Rescue, a no-kill animal shelter and rescue facility that provides treatments and finds the FURever homes of thousands of cats and dogs per year. 3-Hours of showcasing your skills (or lack thereof) on a booze cruise with all of Chicago as your audience! Enjoy the full bar (cash bar), meet and greet with folks from Wright-Way Rescue, and create some great memories with friends! Boataoke is 18+, valid IDs are required.